A tale from Black Friday. Photograph by Allison Joyce/Getty Images. Last Friday morning, I woke up with a single abiding need: I had to have a new Xbox 360. My old one died a few weeks ago—well out of warranty, it came down with the dreaded “Red Ring of Death” technical failure. This wasn’t a big deal, because I never have time to play games, but this weekend my parents were in town and were happy to take care of my pesky toddler. I had a free day. And for me, on a day off, there’s nothing more relaxing than a few hours with the new Call of Duty. So, you see, I was desperate. Not long ago, I would have ordered my console—and every other big-ticket item—from Amazon to avoid paying sales tax. (Yes, I know about use taxes.) But in September Amazon began collecting sales tax in my home state of California, so now it doesn’t cost me any more to buy from local stores. Fortunately, I’m surrounded by big boxes that supposedly carry the Xbox 360: Within a five-minute drive from my house, there’s a Target, Wal-Mart, Best Buy, GameStop, and Fry’s (a California-based electronics chain). Yes, it was Black Friday, so I knew the stores would be a little nuts. But I wasn’t planning to go shopping right when the doors opened, and I wasn’t looking for a heavily discounted item. I just wanted a plain-Jane, full-priced model of a console that first went on sale in 2005. How hard could that be? Very, very hard, it turned out. My terrible experience on Black Friday confirmed what I’ve long suspected about brick-and-mortar stores: They’re inherently, perhaps unfixably less consumer-friendly than online retailers. It also called into question the grand plans that Wal-Mart and its big-box cohort have for fighting Amazon. That, anyway, is the dream, and I still believe Wal-Mart can achieve it someday. But in trying to buy one measly Xbox, I came face to face with two daunting problems for the big-box stores that want to take on Amazon. The first is logistics. The second is people. So here’s what happened. I began my search at about 11 a.m. at Target, which I’d guessed wouldn’t be as crowded as Wal-Mart. Target’s website has a feature that lets you track inventory at your local store, but when I tried to look up whether my store had any consoles left, the system didn’t work. So I walked into the store to look for myself—and, in the electronics department, I found a disaster zone. There were shoppers and carts and merchandise everywhere, and the only two staffers in the area were trying to keep up with the lengthy checkout line. I couldn’t find any Xboxes on the shelves; eventually I located a cabinet with a locked glass door that looked like it had once contained game consoles, but it was empty. I faced a similar situation at GameStop—too many customers, too few employees, and (as I learned from one harried, seemingly 15-year-old staffer) no more Xboxes. My Wal-Mart experience began more promisingly. Checking Walmart.com on my phone, I discovered that my local store did have Xboxes in stock. Like Target, the store was pretty messy, but I did find one blue-vested worker in the video game section. It began to look like I was home free—I would just ask him where the Xboxes were and be on my way. “Yes. Let me show you right here.” I began to pull out my phone, but he would have none of it. “You know, I wouldn’t drive all the way over just because of something I saw online,” he advised. “So you don’t have any left?” I asked, crestfallen. “OK—so the Xboxes are sold out?” I pleaded. Not surprisingly, I didn’t trust Mr. Blue Vest. So, back in my car, I logged back in to Walmart’s site and ordered the Xbox, electing for same-day, in-store pickup. The purchase instantly went through; within four hours, the site promised, I’d get a message telling me to pick up my order. I was ecstatic. Late that afternoon, I did get my Xbox at Fry’s. (The store didn’t allow me to check inventory online or on the phone, but the salespeople were very nice and knowledgeable.) Given that I wasn’t injured in a stampede and I was eventually able to escape into Call of Duty, you could argue that I’m making too much of my Black Friday hassles. After all, wasn’t I the moron for expecting a pain-free shopping experience on the busiest day of the year? Wal-Mart isn’t any less technically capable of providing that level of service. It’s got lots of smart executives and engineers working to make its digital services flawless. The difference is that Amazon’s e-commerce business consists of a single service—shipping stuff to your house from its many warehouses—that it has optimized to amazing ends. Wal-Mart, on the other hand, aims to do lots of different things. It wants to improve its in-store experience so it pairs better with your smartphone. It wants to ship stuff to your house as quickly as possible. It wants to let you order stuff and pick it up in the store without any hassle. If all these things worked, Black Friday would be a breeze: You’d walk in, be guided by your phone to all the stuff on your list, and pay for your purchase with a click of a button. But doing all that is a logistical nightmare. For one thing, Wal-Mart would need to find a way to keep track of its products in a chaotic store, when people are moving stuff all over the place or hogging the items for hours in their carts. It also means retraining its millions of workers to make sure that—even in the depths of Black Friday chaos—they’re always knowledgeable and never less than friendly. And even then, things will go wrong. When you order something from Amazon, there are only a few potential points of failure: the site, the warehouse, and the shipper. At Wal-Mart, there are a billion: Every customer in every store could have a problem with any product or employee. It’s a wonder that the system works as well as it does. This morning I spoke to Joel Anderson, the CEO of Walmart.com, about what happened on Friday. “I personally apologize for the experience you had, and I apologize for any other customer that might have experienced that,” he told me. 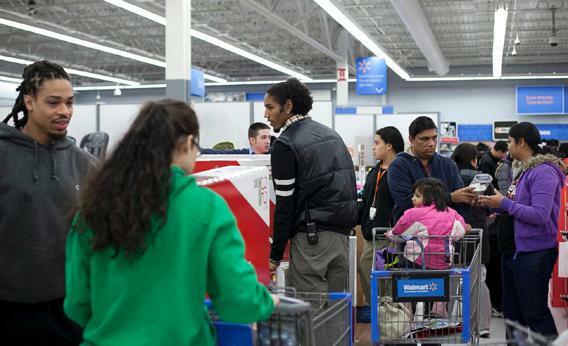 Anderson explained that Wal-Mart had turned off same-day pickup on Thanksgiving Day. “We probably shouldn’t have turned it on Friday either,” he admitted. When I asked about why that Wal-Mart worker had pooh-poohed the website’s inventory listing, he said there were some “misaligned incentives” between store workers and Web orders. At the moment, in-store employees don’t get any credit toward their bonuses for sales made online but picked up in a store. Next year, though, Walmart is instituting a plan that will credit in-store employees with online sales. “We believe that’s a big step in the right direction to get associates equally focused on all types of orders,” Anderson says.